SquigglyTwigs Designs: Would you like this one? Would you like this one? A reversible jacket with tie front closure. 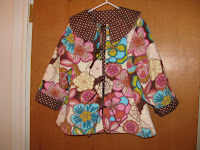 I used anti-pill fleece for the floral side and quilter's cotton for the dot side. I intended to use fleece for both, but couldn't find the coordinates I wanted. For my test version, I made a white unlined waist length jacket. I used the serger to finish the edges and a piece of ribbon to cover the collar seam. It will be a great replacement for the white cardigan sweater I usually buy every year for curly. 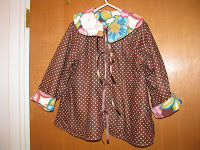 This jacket can be made with 3 layers of fleece for more warmth, or a light weight cotton and short sleeves to go over a sun dress. This looks very pretty. I love the design. I LOVE THIS! Can't wait to get the pattern when you make it. Okay, I am so ready to sew. Do you have the patterns for the new stuff, pants, shirts and the black shirt with leggings? You inspire me girl. I love it! Super cute!